At Habitat for Humanity of Orange County, our homes are built primarily by volunteers. One particular group of volunteers is known as the “Wednesday Crew.” The Wednesday Crew was founded in 1995 by a group of mostly retired men and women who wanted to volunteer during the week. So what keeps them coming out to build every Wednesday through the blazing heat of summer and the freezing cold of winter? Most of it is due to their tireless dedication to affordable housing, but part of it is because of the food. When Linda Foster Momsen and her husband Bruce moved to Hillsborough from Chicago in 2006, she asked her son-in-law Tyler, Habitat’s Construction Director, how she could help. He suggested making lunches for volunteers, and the Lunch Crew was born. Over the years, the Lunch Crew has grown. Rose Dunaway and David Bordsen were members until they moved away. Ellie and Bruce Meade and Margie Miller joined the team. Each week, the Lunch Crew would plan and prepare an entrée, sides, and dessert for 35-40 volunteers. Finding recipes, buying groceries, cooking in bulk, and transporting the finished product to the construction site required an incredible time commitment and level of organization. Fortunately, these efforts were much appreciated by members of the Wednesday Crew, who received hot, delicious meals in the middle of their workdays. Crowd favorites included taco salad, grilled salmon, and carrot cake. On Wednesday, February 24th, the Lunch Crew retired after 10 years of service. 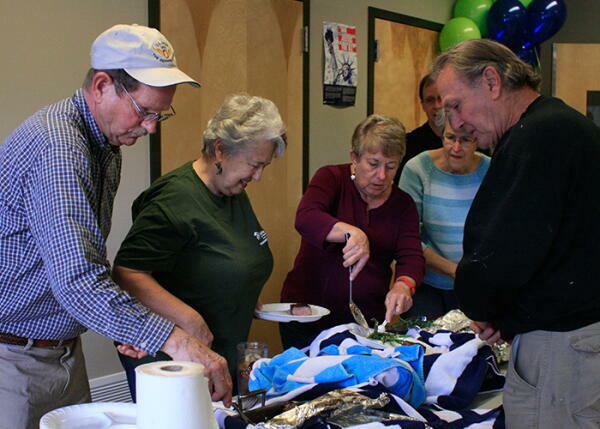 A ceremony was held at the RENA Community Center to honor them and all they have done for Habitat. The Lunch Crew, true to form, cooked and served lunch at their own goodbye party. The menu included grilled New York strip steaks, orzo, couscous and rice, Habitat salad, festive green beans, and cheesecake with blueberries. Members of the Wednesday Crew spoke about how much they appreciated the Lunch Crew and emphasized how much they would be missed. To see photos from the event, click here. Over 10 years, the Lunch Crew witnessed the construction of multiple Habitat neighborhoods. When they started serving lunch in 2006, volunteers were working in the Fairview neighborhood in Hillsborough. Next they moved to the Phoenix Place neighborhood in Chapel Hill and watched 50 new homes go up. They finished their career serving lunch in the Tinnin Woods neighborhood in Efland, which will have 28 homes when it is completed. Linda says that her favorite part of feeding the volunteers has been watching the neighborhoods grow. Many, many thanks to the members of the Lunch Crew. Your generosity and dedication inspires us all.